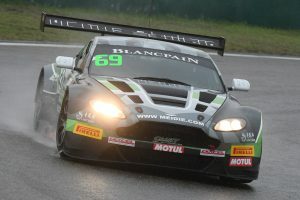 The first day of race action today (14 October) at the new Zhejiang Circuit in China proved to be very successful for CMRT Eurasia Motorsport with James Cai and Kenneth Lim recording the Am class victory with the #69 Aston Martin Vantage. The win puts them just five points behind championship leader, Andrew Haryanto, and a repeat result in the final championship race tomorrow, Sunday, would give the CMRT Eurasia Motorsport the championship victory. The race was held in cold damp conditions which saw a safety car start. Once the green flag flew after two laps of running, Cai drove extremely well to keep the Aston within two seconds of the leading Lamborghini of Haryanto. This allowed Lim to emerge from the mandatory pit stops with a five second lead. He maintained the advantage to the last lap, despite a slight scare when GT4 traffic reduced the gap to just two seconds. The gap grew back to five seconds after Haryanto also suffered a delay negotiating the same traffic. Ultimately Lim took the chequered flag 18 seconds ahead of Haryanto after the latter suffered an off-track excursion on the last lap as the rain started to fall again.